Video of The Week: How Do Fish Eat?? Ever wonder how other creatures consume their meals? Check out this fascinating video on how certain fish eat their food, with amazing slow motion video! What it does: Using the User Defined fields will allow you to set fields in your Progress Note templates that have multiple answers to choose from. What this means for you: You can make a single Progress Note to use when there may be a few different answers, which makes note entry easier. This will help save time and effort, while ensuring a more accurate note taking practice. Step 1. Identify a Progress Note that would benefit from this feature. Good examples to use are those that are used often, have multiple questions or answers that have slight variations, or notes that involve a lot of additional typing to fill in areas. 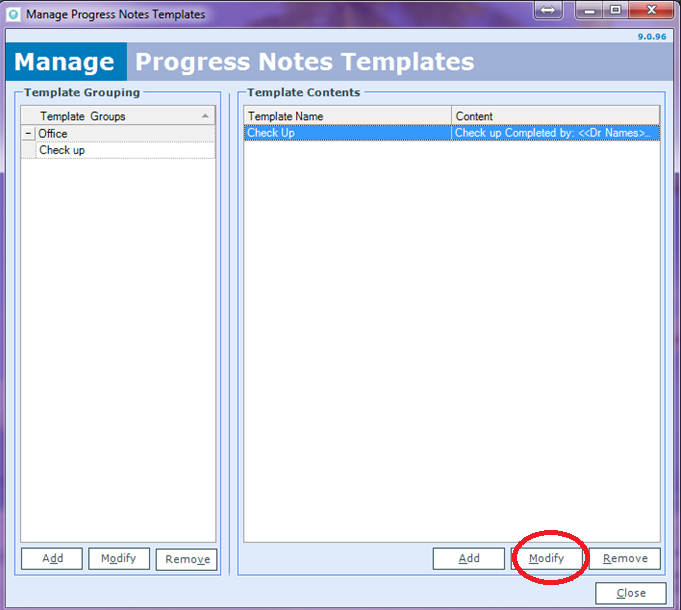 This area can be found by clicking on the Hard Drive icon, and choosing Customize -> Manage Progress Note Templates. Note its title so that you can find it easily in the next step. Step 2. 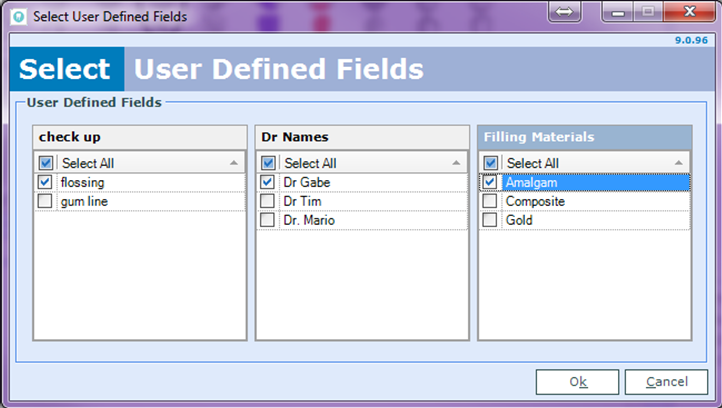 Create the User Defined fields that are needed. 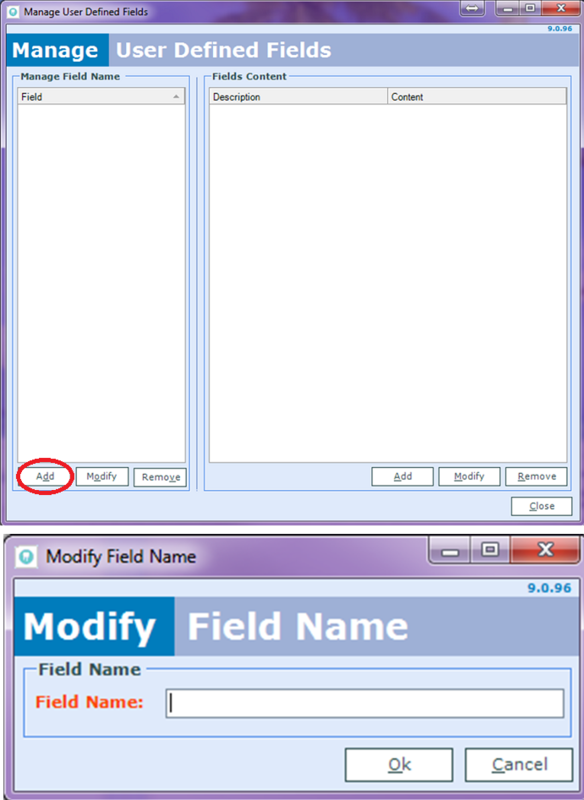 Click the Hard Drive icon, and choose Customize -> Manage Letter Template User Fields. Click the Add button on the bottom left to bring up the Field Name window. You can repeat this process many times to create all of the choices that you feel you need. Step 3. 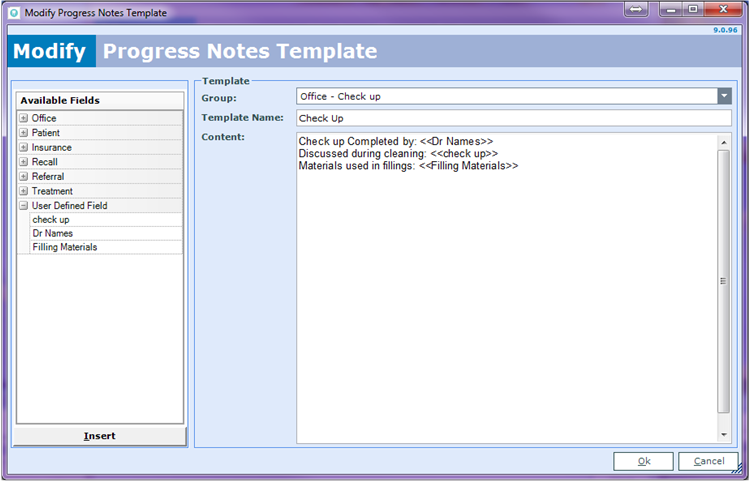 Insert your newly created multiple choice field into your existing Progress Note template. Click on the Hard Drive icon, and choose Customize > Manage Progress Note Templates. On the left side highlight the User Defined field that you want. 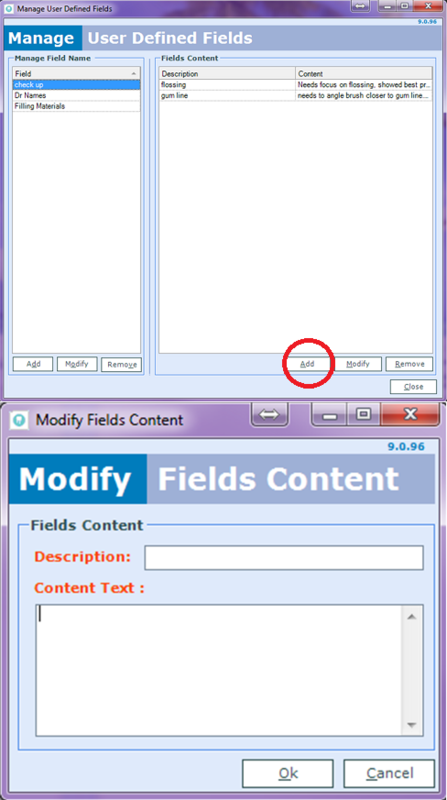 On the right side where you can type, place your cursor anywhere you want for the new field to appear, and then click the Insert button. This will auto fill the template with something that looks like "<<field name>>". Press OK to complete. On the right side of the window, you have your Notes Templates. Select the one you have just created. When you press OK, the Notes section of the chart will be filled with your template and only the selected User Defined fields. Follow Us on Social Networks For Even More Tips! Relax in an award-winning, five star resort, and learn from the best clinical and dental business speakers in Canada. We're pleased to partner with K-Dental, Dental Management Secrets, and MSI Canadathis year to present a unique dental course in Mexico. As a dental professional, you are always looking to improve your skills. Many courses are available, but rarely are you able to combine clinical subjects that expand your clinical repertoire with the knowledge to integrate them into your dental business. Enjoy beautiful Mexico and gain new skills and knowledge that will pay dividends immediately on return. Click the link below to learn more on our course information web site, and pre-register for FREE. There is no obligation to commit once the official registration opens in early August, but the short survey you answer during the pre-registration will help us better plan the event and entitle you an exclusive 10% discount, a chance to win a trip for two for free to Mexico, and secure your spot. 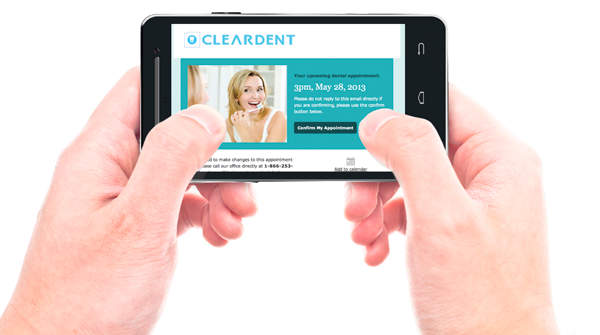 More and more of ClearDent offices have added ClearConnect, our cloud based, automated patient communication system. In 2013 alone, over 500,000 appointments, recall reminders and greetings were sent to approximately 120,000 patients. As modern society is ever more connected, ClearConnect is much simpler and effective for both the patients and dental practices. The end result? An immediate decrease in no-shows, and increase in booking rate. More importantly, ClearConnect takes the stress of being compliant with Canada's Anti-Spam Law (details on the law here) completely off your shoulder. To commemorate the growth and achievement of ClearConnect, we're offering 3 months free ClearConnect Email when you signup before July 31, 2014. With the overwhelming success of ClearConnect, we are setting up the stage to help dental practices embrace, utilize, and grow with cloud and mobile solutions. Practice Insights, an in-depth cloud-based analytic tool, will let you access your practice performance reports anywhere, anytime using your phone, tablet and desktop. ClearMobile, available in Winter 2014, is a suite of native iOS Scheduler, Charting, and Digital Imaging apps that works with iPhones and iPads. 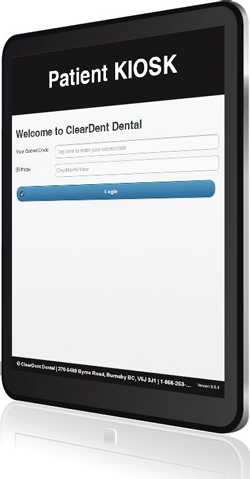 Do you know that ClearDent has built-in KIOSK App that works on Apple iPad andAndroid Tablet to help you collect medical history from the patients and sign digitally? The app is intuitive, sleek, and most patients love it. Best of all, it could be FREE as it's part of the ClearDent Premium Edition, which you may already have but just didn't know that you can activate it. As well, with the recent introduction of Canada's Anti-Spam Legislation, a KIOSK on a Tablet is one of the best way to capture express consent offline*. * Check our guide to understand CASL consent and best practices to compliance. The survey is taking place to allow us to know what areas where we need to improve to enhance our provision of Customer Service, Product Development, and Overall Experience. It will take approximately THREE MINUTES to complete the survey. Your participation in this survey is completely voluntary and you can withdraw from the survey at any point. However, your feedback is important to us and we will greatly appreciate your participation. The response to the survey is strictly confidential and will be protected with uttermost care, and data from this research will be reported only in the aggregate. As a token of thanks, you can optionally provide your contact information at the end of the survey for a chance to win a FREE Lunch on us (up to $75 including tax and tips; winner will be drawn from responses submitted on or before August 15, 2014). 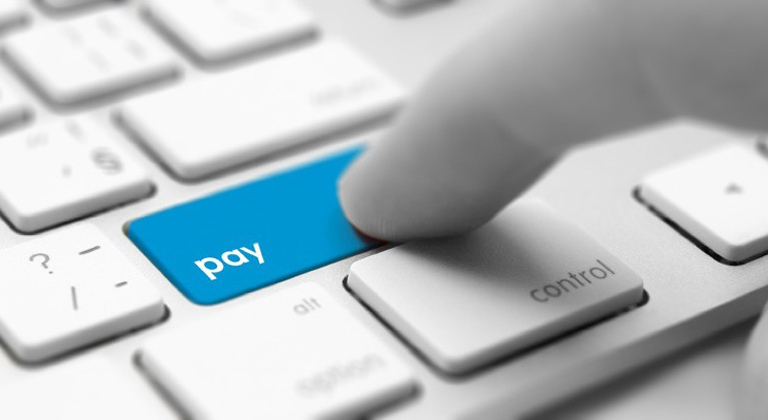 Simply visit www.cleardent.com/pay, enter in your information, and your invoice will be paid off! You will receive a receipt in your email almost immediately. We are also using the latest encryption and security methods, so you do not have to worry about your information being compromised. The latest news regarding the Heartbleed bug does not affect us at all, as ClearDent takes advanced measures to always remain protected. As always, if you have any questions or concerns, please use the web feedback form on our website. Your input is sent in private to the management at ClearDent. Keep in mind that the feedback form accepts complaints as well as compliments. Good or bad, we'd love to hear what you have to say. Video of The Week: Should We All Be Eating Insects? We all think of eating insects as disgusting, but can they actually be beneficial? With the World Cup final coming up, we decided to share some interesting facts about the host country! Watch this video to learn something new about Brazil! The immune system is fascinating! This beautiful video illustrates how everything works. Remember, keeping up with a clean oral health routine is your first line of defense! Alberta practices sending national Blue Cross claims via the Alberta Blue Cross EDI system may be getting input errors, such as "Input String Not In Correct Format". There are specific ways the provider needs to input this data in order for it to successfully go through. A representative will guide to ensure the information is entered correctly. 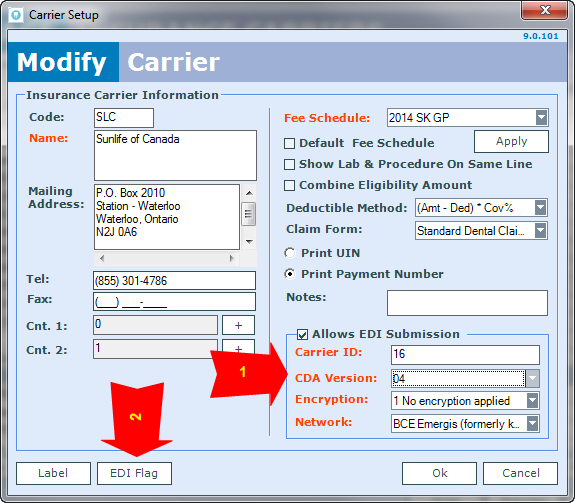 There have been some changes to the EDI process for Sun Life, effectively immediately. Recently, some dental claims to Pacific Blue Cross have been rejected due to incorrect patient ID numbers. When entering numbers into the Policy and Member ID fields, enter Policy/ID numbers exactly as they appear on the ID card presented, and include any leading zeroes. If they don’t have a new ID card, submit claims using your patients’ most recent Policy/ID numbers issued prior to April 4, 2014. Make sure Policy and ID numbers correspond to the correct COB plan. 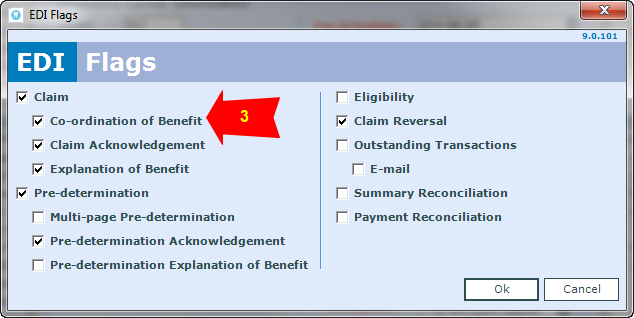 Check that you have entered Policy and ID numbers in the correct fields on paper claim forms. 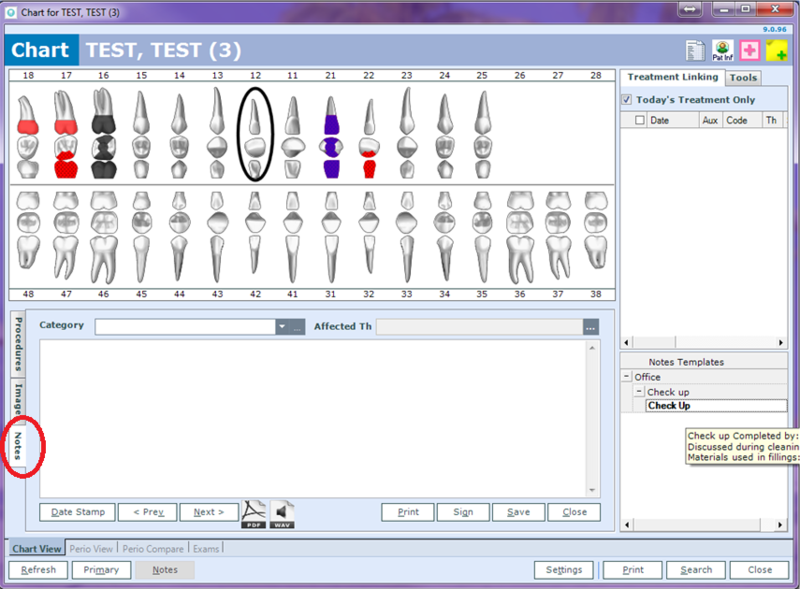 Update your dental software. *Dental Providers can also verify new member IDs from provider statements, by signing into PROVIDERnet or by asking patients to sign into CARESnet or CARESnet Mobile to download their new ID cards.